1995 Mercedes-Benz E320 Cabriolet in excellent, Ultra-Low mileage condition. Second owner with extensive service history from new including Clean Carfax. New Battery and Tires. Has all factory recommended updates performed by the dealer including updated head gasket. 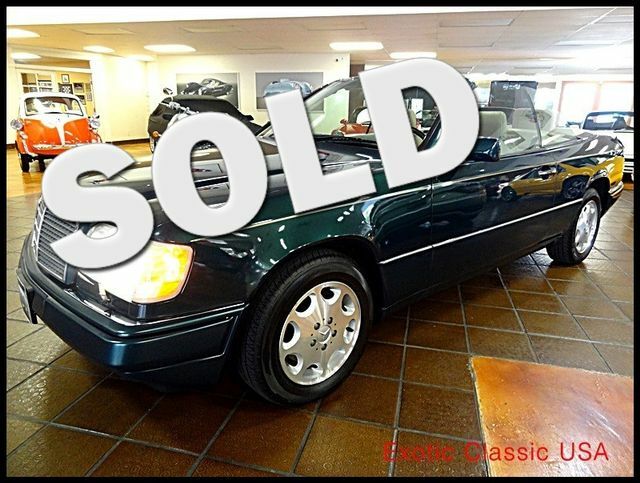 THIS AMAZING M-BENZ E320 CONVERTIBLE HAS ONLY 38,000 DOCUMENTED ORIGINAL MILES !!! YES- THIS E320 WAS BOUGHT NEW AND LEASED BY IT’S CURRENT OWNERS MOTHER IN FLORIDA, WHERE IT SPENT MOST OF IT’S OWNERSHIP GARAGED AND WELL MAINTAINED. EXCELLENT TIRE TREAD ON ALL FOUR CORNERS. FRESHLY DETAILED PAINT/BODY, INTERIOR AND ENGINE BAY. THIS IS ONE OF THOSE CARS THAT WILL SURELY ONLY GO UP IN VALUE . All Vehicle Available for 3rd Party Inspections, paid by customer.